Just finished and posted these 3 hats off and a new born blue babies cardigan to Guardian Pharmacies for World Vision. 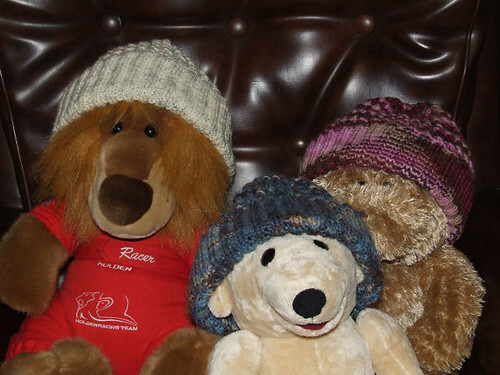 The 3 hats are for children aged 2 to 4 years of age. The models are from Amy's room. These hats are off overseas for the up coming winter in a poorer country. Re: Kintting for the needie. Good on you Lucky. I had lots of good intentions, but am still doing other knitting projects. They are some good looking beanies. I have now started to knit beanies for my stall.